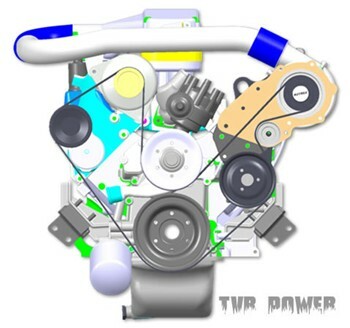 The tvr Power Supercharged 400 at Spa Future of RV8 tuning? I first saw the “Blower Chim” at Brands last September. Seeing it around and on track convinced me of the power and quality, but the short “Indy” track was very busy and to be fair…the “Indy” circuit is hardly a power track! Autodesign were there (the designers of the blower component) with the car and were keen to check it out and, more surprisingly, get my view on the car. As you may have seen in my previous “Blower” article I was very impressed (http://www.tvrmonster.co.uk/news2.html) but felt that I really couldn’t “press on” the way I would have liked on the day. And that was pretty much that. The car arrived at the Port on Monday morning having come down from tvr Power overnight. Marc had Corin Denton with him as Co-Pilot and navigator and the pair of them pretty much ragged the car all week, wheel spinning off roundabout, junctions, everywhere really. But hey, Dom did want it checked out. On the Auto routes to the Ring (about 400miles) we had tweaked Cerberas, Griffs, a Tuscan Racer – allsorts, and it was kicking it with the best of them all the way down - as can be seen from the video clip for the trip. http://www.tvrmonster.co.uk/videosparing06.html That’s a 4L Chim with Tweaked 5L RV8s, a SP6 and even 4.2 / 4.5 AJPs averaging 360bhp! It sounded great too (as you can hear). Over the trip there were various fuel stops, all of which generated a lot of interest with the locals. In the Shell Services above Spa, a regular track go-ers watering hole, we caused quite a stir with requests to have bonnets raised and throttles blipped to the cheers and gratification of the locals. 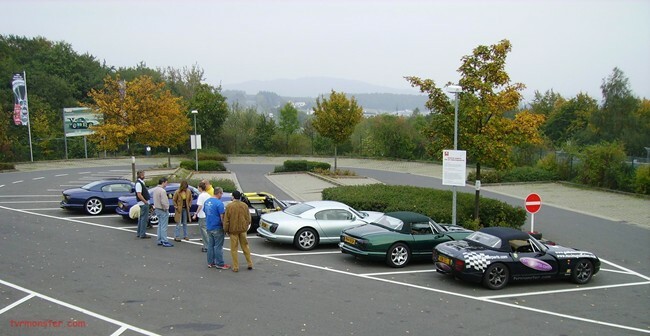 Remember we had half a dozen modified tvrs all in one car park. I didn’t drive the Chim at the ‘Ring. I wouldn’t have learnt much due to the nature of the track and Marc and Corin wouldn’t get out of the bloody thing! The car did have a couple of minor problems on the trip, but nothing serious. A flat battery on the ferry, the plenum inlet pipe popped off a couple of times, and the blower oil reservoir leaked under lots of high revs and hard work. All of these were minor issues that Dom has now eradicated, or has new products designed in to combat. Things are being done properly here! We also spent sometime setting up the suspension for Marc. As the car had been in Switzerland, with Dom and Howard Bryan (also a Challenge driver and Sprint magazine editor) and two weeks worth of luggage aboard, the settings had been “softened a bit” for comfort, and it is still really a road car. It’s easy to forget that with the power delivery it’s got. Anyway, Marc’s used to his race Griff and wanted things tightened up. The beauty of our “monster” trips is that we can set the cars up for you at the track as well as taking care of all the little niggles. So by the end of out two days at the ‘Ring the Blower was running beautifully and the handling was pretty good for a road going car. And soon we were off to Spa. I’d like to put a reminder note in at this point. The “Blower Chim” was in a pre-production state on this trip and the whole point was to give it a last HARD time before being stripped down for final approval and clearing. Dom had told us to try and break it, get as much from it as possible and push as hard as you can. With over 13,000 miles across most of Europe (that’s over 4 years average tvr mileage!) on it, we put another 3000 on, on and off the track and other than a couple of minor glitches it was flying. Power was never in doubt and the delivery was seamless and progressive, so there was no chance of it catching you unawares. So how would it do at Spa? The ultimate drivers track? Lets see. I love Spa. There’s nowhere quite like it…anywhere. As a circuit it’s got it all. A hairpin, super fast corners, slow off camber - grip sapping corners, the longest power climb in racing and if that’s not enough…it’s got Eau Rouge! So after a full day of charging around in my 400bhp track spec Griff, Marc reminded me that it really was about time that I had a go. My own is pretty well sorted. Beside the power it has track tyres, suspension, AP brakes, and harnesses…you get the picture. So I know what it feels like to drive a quick tvr around Spa. So how was the SC400? Taking the usual first lap as a warm up (4 miles!) I settled in and checked the car out. Brakes were fine, as Dom has fitted the AP conversion along with Spiders. The ride fairly soft and predictable and grip limited (due to the road tyres and hi torque levels) but still a very well sorted Chim. But there was something else. All the time we were lapping, the torque was evident, the eagerness under very little throttle travel…it was clear that this engine was special. To tell the truth, it didn’t feel a million miles away from my own car, and I don’t get that feeling very often. Pressing on now but what are we looking for? The whole point of a Blower is to shove in as much fuel air mix as possible. The more mix in the cylinder the more power, therefore a 5L car will draw in more mix than a 4L car giving more power. Bigger lungs as it were. The point of the blower is that you don’t need all that expensive porting, trumpets and cubic capacity, the blower stuffs the air in under a pressure that you set. So a supercharged car” feels” like a much bigger car. This is the same theory as with a turbo, but being belt driven it has the disadvantage of consuming some power to run it. The advantages are it doesn’t use a huge very hot exhaust system (critical in a tvr) and it has no lag. The SC400 felt and drove like a sorted 5L. There was no fluffing, no lack of power at any point. It didn’t pink and it didn’t rattle. It just pulled and pulled…AND PULLED! It was quite amazing really. All the way up the Kemmel Straight it just kept going. And the Kemmel straight is known in F1 as a true test of power, an engine breaker. Full throttle for 10 or 15 seconds whilst climbing around 100m, now that’s tough and as you can see in the footage it just loved it. That’s one strong engine. As the laps unfurled, I pushed harder and the laps became quicker. The eagerness of the engine and the power it develops mean that on the track you run out of revs quite quickly. A close ratio gearbox would help here but that would be for the more serious track user and I have to say that the 4L clutch (with 15000 miles on it remember) was having difficulty holding the power on quick up-shifts, but other than that… outstanding. The power is easily controllable too; the power band is as broad as the rev band making the choice of gears easy and unproblematic. The rev limiter was set at the usual 6.2K for tweaked cars and this was very apparent. The RV8 looses power as it moves up the rev range and you can feel when you need to change gear, but on this car I kept hitting the limiter, as there was no clue. It pulls all the way to the top. On the track, the combination of effortless grunt at any revs makes the car very quick. As you can see from the footage, the car has loads of power on the straight as you might expect, but watch it when exiting the corners. Put your foot down in any gear at any rev and that car takes off and the smooth delivery means you can access that power very early after the apex making it very quick out of the corners. A devastating combination, and if Marc has one next season in his Griff, he will truly be a force to be reckoned with. For 90% of 4L RV8 owners (tvr or otherwise) this is going to be THE engine mod of the future, have no doubt about it. It has it all. Strong, beautifully crafted, well-proven and good value. Bolt on kits will be available, firstly for tvr Power fit only, then to approved Installers and then finally, no doubt to Individuals. There will be a ROAD GOING kit for putting straight onto a standard 4 & 5L cars. This will be developed to supply seamless and effortless power for road use, with a 4L car delivering 5L performance. A TRACK-GOERS kit, with extra boost. This will give more punch and requiring some additional fettling such as cam/clutch work and probably bigger injectors etc. And finally a RACE/HIGHLY MODIFIED kit with major work required holding the extreme power that will be available. 500bhp should be possible with all the right bits though this will required a complete rebuild and drive-train modifications to deal with the all that grunt. They should be quite spectacular! All in 4L, 4.5L and 5L versions with intercoolers and trick bodywork coming too! I can’t wait! So, is this the future of RV8 tuning? I think it probably is. It’s also possibly the most significant advance since John Eales developed the twin plenum on in the mid seventies. The 4.5 & 5L kits are being developed now and are showing the same superb results. I can’t wait! Don’t forget the Official Supercharger Launch!! !